Today involved and early morning start and by early I mean early! 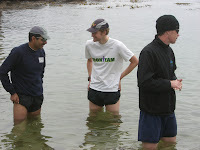 The team was to meet down at Pacific Groove (home of the kelp crawl) for a swim and long run at 8am. Luckily I was carpooling so didn't have to be fully coherent for the drive down. We got there early and the weather was no how you expect it to be from a post card, it was decidedly gray and cold, though good for running, but not very inviting for a swim. There was some discussion on whether the swim would take place or not, it was planned to be a long swim, more of a short mental toughness exercise. The decision was made to go ahead with the swim, although not the whole team were taking part I decided not to past opportunity to get into the freezing cold water and attempt a swim. 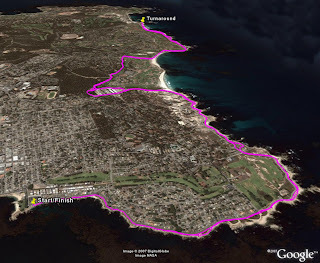 The water was indeed cold, I swam with head out of the water nearly all the way to the turnaround point. On way back I my motoviation to take the plunge and put my head was so I could swim faster and get out of the water quicker. After drying off I headed out with my team mates on the run, the weather was perfect it was overcast and cool. I started off at a good pace and kept it going all the way to the turn around point at mile 7, where a support station was setup. On the way back I picked up the pace a little, though this was my longest run since Wildflower and was a little uncertain how my legs would. Has headed towards the mile 11 I could feel the pain creeping in so I decided to walk for a bit. Realizing walking was just as uncomfortable I decided run the remaining couple miles, overall not a bad pace and dip in the ocean to cool the legs was nice. It was a actually a good confidence builder, as my longest run recently has been only 7 miles before this.